I definitely agree. I provided similar advice to my social media clients, urging an American one in particular to post a genuinely compassionate response. Being completely silent when everyone on social media is focused on a crisis can also be perceived as insensitive. Crises such as this remind as that underneath our companies, brands, and professional positions, we are all human. Epicurious is disgusting for those tweets. I agree that brands should send out their condolences/respect following a disaster or tragedy, then shut down their social media for a limited time to let everything cool down. Adding noise to the information-flow shows insensitivity and hurts business as a whole by digging a deeper hole in the greed field and only caring about profits. Brands must show that the people working for them are also human during these times. If you have nothing productive to say, don’t say it. Thanks Farah and Justin for your comments. Much of this sounds rather obvious but there are three things that go against the grain – 1. people may not anticipate this type of situation. 2. World events require quite skillful navigation. 3. Common sense is not common.. 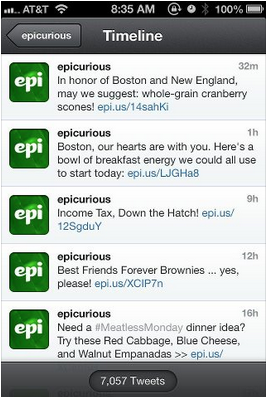 I think Epicurious could be driven by someone with a mandate – who may not understand how to properly react. Could be a junior assignment or a brand that’s made the early stage mistake that social media management is one person’s responsibility and not an integrated team. They probably thought they were being sensitive but were combining messaging with what was scheduled ‘to go out’. Who knows. I do think it is important to coach brands / sr. marketers that planning some content is okay but there remains >50% of content that you can not plan for. Only respond, engage in the moment and react.